The Umrah is a journey to Mecca, in Saudi Arabia. In Arabic, Umrah means to visit a populated place. Umrah can be performed out at any time of the year. Umrah is sometimes called the “small hajj” of Islam. Hajj is the compulsory pilgrimage. We provide best and cheap Umrah packages in Bangladesh. We also added hotel booking, air ticket booking and visa registration process in our packages. Contact us for getting reasonable Umrah services. 3 days Turkey guided group tour. 3star / 4star Hotel accommodation. Umrah is not mandatory, but it is highly recommended. Here we present the formalities of Umrah. The perfect time for Umrah is the days before, during and after the Hajj, and during the last ten days of Ramadan. Small bag to store shoes when entering a mosque. Scissors, razors and nail clippers (for grooming before Ihram). First formalities of Umrah is Travel to a miqat. 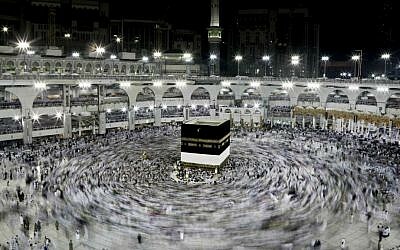 Just as in the Hajj pilgrimage, a Muslim cannot travel directly to the Kaaba in Mecca to begin Umrah. There are five miqat surrounding Mecca, which are especially sacred barriers by which all Muslims must pass before proceeding with their religious duties as pilgrims. In the miqat, all pilgrims must assume a special state of religious purity called Ihram. Externally, this is marked by placing a certain special clothing. For men, these clothes are two special pieces of white fabric without seams. For women, this is ordinary but loose and conservative clothing. However, the Ihram is more than just a uniform. It is a state of mind and a code of behavior that marks the complete devotion of the pilgrim to the duties of Umrah. Discuss, shout, use immoral language or act aggressively. Show affection to one’s spouse or have a sexual. Shave any part of the body, cut the nails and use perfume or scent. Cover your head, wear socks or closed shoes (for men). Women can cover their heads and wear socks. Umbrellas are acceptable for both sexes. Killing animals except in self-defense or in the case of annoying pests, such as flies and mosquitoes (in both cases, chasing away the animal without killing it is preferable). In the miqat, the pilgrim recites a special short prayer called Talbiyah. This recitation announces the presence of the pilgrim to God and consolidates his intention to complete the pilgrimage. Pilgrims are recommended to repeat the Talbiyah throughout the pilgrimage when they have time. If you are going to fly, consider taking the Ihram before or during your trip to Mecca. Today, Muslims around the world travel to Saudi Arabia by plane. However, because the most active airport in Saudi Arabia is in Jeddah, which is technically located within the border of the miqat, many Muslims choose to assume Ihram status before or even during their trip. In this case, the pilgrim must bathe before leaving and make sure to change to the appropriate clothes for the Ihram at some point before the plane crosses the traditional borders of the miqat. Generally, it is considered better to assume the state of Ihram long before crossing the border of the miqat. Then, to wait for the plane to approach the border and run the risk of crossing it without being purified. So, be sure to give yourself enough time to change. Once they have assumed the Ihram in one of the miqat, the pilgrims proceed to the Kaaba, the most sacred place in all Islam. Until they reach the Kaaba and begin performing the Tawaf rituals, it is recommended that the pilgrims repeat the Talbiyah continuously for themselves (or as often as possible when it is reasonable to do so). Pilgrims can also offer their own special and unique prayers to God or recite parts of the Koran; The exact words that you offer are not as important as maintaining a solemn, humble and devout mentality. In the Kaaba, the pilgrims complete the Tawaf. The act of walking around the Kaaba seven times in the anti-clockwise direction. Each “round” begins and ends when the Black Stone is to the right of the pilgrim (there is a brown line of marble that marks this starting point). The pilgrim recites a short prayer before beginning to express the intention to complete Tawaaf. The first three rounds must be completed quickly. The next four, slowly. While completing the seven round, the pilgrim is encouraged to touch and kiss the Black Stone in each round if possible. Men should expose their right shoulder by placing their tunics under the right armpit. Tawaaf is a very special experience during which Muslims have a greater opportunity to express their devotion to God than during their regular life. While the Tawaaf is complete, the thoughts must be pure and focused on God. Many pilgrims also choose to offer oral praises as they walk. After Tawaaf, the pilgrim completes another special ritual of Umrah called the Sa’i. The Sa’i involves walking from one side to the other between two small mountains called Safa and Marwa. Beginning with Safa, the pilgrims complete seven rounds, making a total of four stops on each mountain. Other desirable behaviors for the Sa’i include walking at a rapid pace between the two green signs on the side of the road. Do prayers or reading the Quran, abstaining from talking to others and reflecting on the Day of the Sa’i. After the seventh round of the Sa’i, the main events of the pilgrimage have concluded. At this point, pilgrims in Marwa shave or cut their hair as a sign of their “renewed” or “rejuvenated” symbolic state. Men are strongly encouraged to shave their heads. Cutting hair is allowed, but shaving the head completely is preferable. Women only have their hair cut. After this haircut, the Umrah has ended and the pilgrims are released from the state of Ihram. They can return to their normal clothes and assume their normal behavior, although they must maintain a humble and devout mentality while in Mecca. If you are performing the Hajj, do not cut your hair. While the Umrah can be performed on its own, the formalities of Umrah also constitute the first part of the longer pilgrimage called Hajj. If Umrah is being performed as part of the Hajj, the pilgrims usually ignore the haircut ritual described above and do not leave the state of Ihram. If they cut their hair, they must re-enter the state of Ihram before beginning the rest of the Hajj rituals. Most of the people perform Umrah at the time of Ramadan. We are the best Hajj and Umrah agency in Bangladesh. We offer best and cheap Umrah packages in Bangladesh for all season.